All the birthdays I do for the kids can't be sensational. I mean, Little Miss' party was pretty darn awesome. Well, except for the cake. Maybe I just need to skip making birthday cakes. My ideas start out well enough. And not just that...multicolored cake batter. Of course Leelee says it looks ugly. What does she know. She's 13. These cake pops were for Danger Girl who turned 9 over the weekend. Nine year olds think any type of food on a stick is cool. Once the cake pops for the class were done, I left them to cool. And, as any good blogger who wants a project pinned knows...presentation is crucial! Plus, I needed a way to get the cake pops into the school while holding hands with a three year old. Not an easy task. So, I got a box and covered it in white paper and tied a lovely ribbon and bow. It was very pretty. Next, I put the sticks in the cake pops which resembled little multi-colored planets. It was time to frost. Or dip in chocolate. Or something. And this is where I realized something was going horribly wrong. First, it was humid and hot. So nothing was really going to stick anyway. Second, the cake was just falling apart as I tried. Third, I could not figure out how anyone managed to get this piece of mushy cake to look pretty. I did what came naturally. I whined on facebook. That's when a friend's mom came to my rescue and told me I needed to freeze the little boogers before frosting. But it was too late for that. I had already stuck the totally gnarly looking cake pops into the lovely box. Isn't the box cute at least?? I don't think the ladies at the office had ever seen a cake pop before. They were like "ohhh those are so cute!" and I'm thinking "What the heck? These are totally UGLY!" The kids in Danger Girl's class didn't seem to care either. It was cake. On a stick. And my kid thinks I'm cool. So I guess it wasn't a total flop. Ugly food tastes good. Maybe it tastes better, 'cause you're expecting prettier foods to taste amazing, and often they are mediocre. Yes, I have a lot of experience in producing ugly baked goods...way too much. Well you certainly get an A for effort!! I am sure they were delish! We have the same cake pop maker and it never works for us either. I have had more than one cake pop failure! Thanks for the freezer tip! Will you try them again? Oh my goodness, that is hilarious. I love a blogger that can share the good the bad and the ugly. I would have proudly eaten one of your cake pops. I, too, am of the a cake is a cake philosophy. 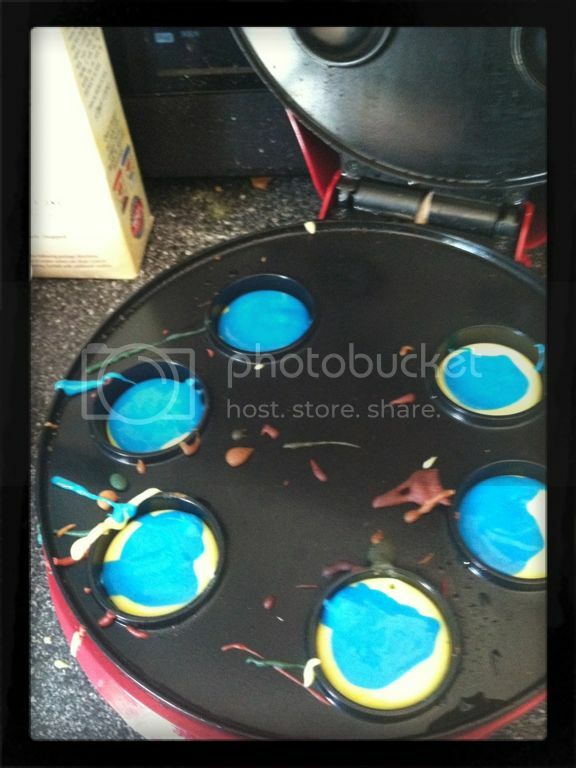 I'm sure it still tasted wonderful and kids love cake no matter what it looks like! I have never made cake pops because it just seems like a lot of work and why ruin a perfectly good cake just to make it into little balls of cake, ya know? I do love the box/present idea though. Thanks for sharing at Creative Thursday this week. Have a wonderful weekend. Haha I like the comments from the ladies in the office. I'm sure they would taste so good! I'm a new linky follower, feel free to stop by and follow back! I don't know but multi-colored cake batter seems pretty major league to me! And you get a "A" for the box idea, it's great. You just can't go wrong with cake on a stick!! Love this post! I just made 120 cake pops for a wedding as table decorations. 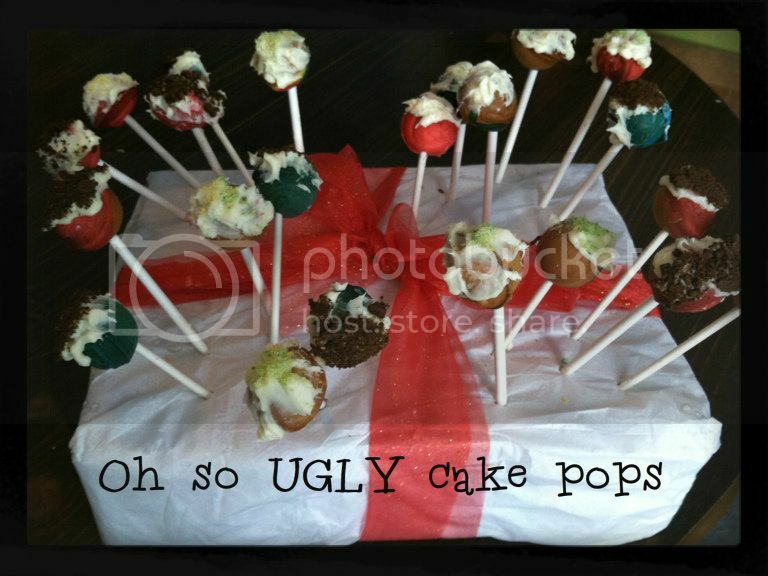 I found an incredibly easy way to make cake pops (this was before I started my blog so I don't have it on there...will have to make them again to post). Any who....my tip -- I didn't buy a specific pan to make them. I made the cake like normal in an 8 x 10 cake pan. Once it is cooled, crumble up (if the edge is a little crisp, you can toss that part out). Mix in about 1/4 to 1/2 container of frosting, just enough to make the batter "sticky". Scoop about a table spoon of batter and roll between your hands to make "balls". I find that this way is much quicker...a bit messier, but oh what fun. LOL. Once you have your pan filled, place it in the freezer for approximately 10-30 minutes. LOL! Oh man, I almost cried laughing at this. Thank God someone else has also experienced "cake pop catastrophe"! Why does everyone make it look so easy?! Stupid Pinterest got me all excited about Cake pops so I go out and buy a machine and the first thing my hubby says when he takes a look at them is: "Aren't they supposed to be round"? Lol. Needles to say, I'm not sure I'm ever attempting to make these stupid little balls again. There's some things that maybe are worth buying at the store, haha.